In June, firefighters from Fairfield County, Connecticut, and Westchester County, gathered in Stamford, Connecticut, for a large-scale tanker drill. 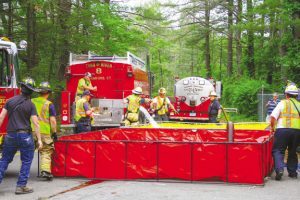 The drill, which took place at the Stamford Reservoir, had companies drafting water from a section of the reservoir to load up the tankers and then shuttling it down the road to a dump site of three portable tanker pools. The water was pumped through an engine to another engine which fed a blitz gun and a tower ladder. Crews ran through two sequences of the drill, the first one using a level one tanker response and the second one using a level two tanker response which includes more tankers responding to an incident. 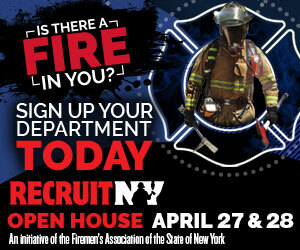 Departments from Stamford, New Canaan, Long Ridge, Turn of River, Springdale, Glenbrook, West Redding, Cos Cob, Stevenson, Banksville, Vista and Croton-on-Hudson participated.